I will admit that this photo makes the nursery out to be VERY busy, which ours will not at all be. We'll have the crib bedding stuff, a valence, a lamp, a night-light, a mobile and the three little wall hangings. But we ain't goin' crazy with all those dots everywhere! No diaper stacker (in my experience those things are useless!) nor a hamper (again, useless) nor the wall border. No monkey rug, either, since the baby's room is carpeted -- although I do think it is a cute rug! 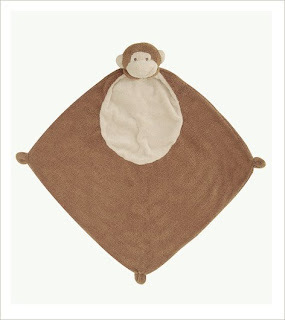 Probably because I think the monkey rug is so cute, I've decided on which Angel Dear blankie I'll have for the baby. LO is hooked on the brown teddy bears, and this little guy is gonna get monkeys! Is it wrong that I'm already working on a baby registry at only 18 weeks? I'm such a planner, and I can't help that I'm so stinkin' excited about adding a baby boy to our family mix. Plus, I love shopping for stuff that I (hopefully) won't end up paying for! I already told hubs our baby registry will be lean and mean this time around. A couple of towels, a blue blanket and some diapers is about all we're in need of! Should be fun! Ummm, that rug is about the cutest one I've ever seen for a kid! !